Timber Block’s Pisgah Mountain Lodge would have been built in a day had it not been for a tornado warning. 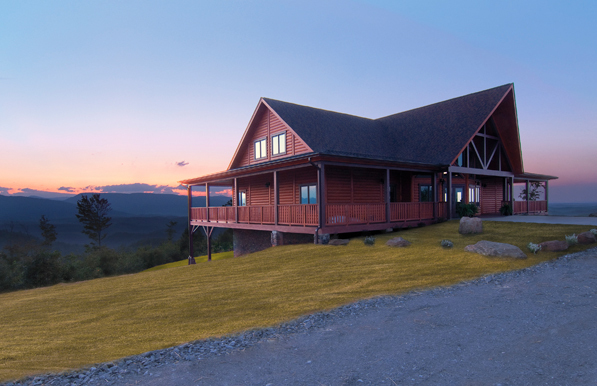 In August 2011, Timber Block unveiled its Pisgah Mountain Lodge, the nucleus of a North Carolina mountain-community development called the Coves. If it hadn’t been for a surprise tornado warning that shut down construction at 3 p.m., the walls of the 6,000-square-foot, $1.4 million lodge would have gone up as Timber Block projects typically do: in just one day. The firm’s parent company was founded in Canada in 1977, where it developed a proprietary building system intended to improve insulation values and reduce the construction time needed for log homes. These days at a Timber Block manufacturing plant, furniture-grade white-pine timber is dried to eight percent moisture content, pressure injected with a core of polyurethane insulation, and precision cut. The logs are then stacked to form a home’s interior and exterior wall panels, which are bolted, double bonded, and sealed inside the factory. The preassembled panels are delivered to building sites—along with ceiling, roof, and flooring materials—with windows and doors precut, and a crane lifts them into place. For these communities, in addition to building central lodges, the company also custom develops accompanying properties, from large-scale vacation homes to smaller price-sensitive residences. At the Coves, for example, Timber Block established a cabin program for weekend users, where homes cost approximately $130–160 per square foot. Timber Block builds homes such as the Pasadena with panels of white-pine timber dried to 8% moisture content. For Timber Block customers, that smart shopping is realized in cost savings from energy efficiency. Whereas a traditional log home’s walls might have an R-value as low as R-5, the insulation in Timber Block’s warp-resistant residences can achieve an R-value as high as R-30. This energy efficiency is underscored by other green elements, too, including a low-VOC sealant applied individually to each log—which protects the homes’ exteriors while permitting moisture to escape—and insulation that contains zero ozone-depleting substances. Update: Stop in and visit Timber Block’s newest model home at 3708 Curley’s Fish Camp Road, Connelly Springs, NC, 28115. The beautiful 3,100-square-foot show home is based on the company’s popular Denver model. The model has a slight contemporary twist, incorporating stainless steel, glass railings, and beautiful granite countertops while still respecting some of the elements of classic log-home design. It’s located off I-40 near Hickory at exit 118, and visitors can stop by seven days a week.